BREMEN - Jesse Jewel Edwards, Sr., 77, of Bremen, died Monday, January 25, 2016, at 7:43AM at Owensboro Health Muhlenberg Community Hospital. Mr. Edwards was born September 21, 1938, in Muhlenberg County. He was a machinist at Calumet Screw Co., and was of the Pentecostal faith. He was an avid football fan, and his favorite player was Peyton Manning. He enjoyed playing cards with his family. He was preceded in death by his mother, Retha Frost. 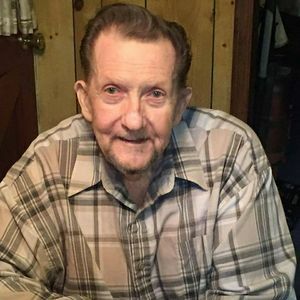 He is survived by his wife, Juanita Smith Edwards; sons Steven (Tammy) Cox of Greenville, Michael Edwards of Bremen, and Jesse Jewel Edwards, Jr., of Bremen; daughters Darlene (Greg) Flores of Hammond, IN, Gwyndolyn (John) Lovell of Bremen, and Tammy (John) Irwin of Maryville, TN; half-brother Irvin (Dorris) Jones of Michigan; 10 grandchildren; 14 great-grandchildren; 2 great-great-grandchildren; and several nieces and nephews. Funeral services will be Thursday, January 28, 2016, at 12:00 noon at Tucker Funeral Home in Central City, with Bro. Donnie Neal officiating. Burial in Mt. Moriah Cemetery. Visitation will be Wednesday after 6:00PM and Thursday after 10:00AM at the funeral home. Online condolences may be made at www.tuckerfuneralhomes.com. Create An Online Memorial For Jesse Jewel Edwards, Sr.
Sis. Juanita I'm so sorry to hear about Bro. Jesse.. I pray God will comfort you and your family during this time of sorrow.. I hope these words will help comfort you and your family..
May God Be With You..
We are all so sorry for the loss of Uncle Jesse. He was a wonderful man and we all loved him very much. Prayers for Juanita and all the kids in this time. Sending condolences to the family. We're very sorry to hear of your loss. Sending love to Darlene and her family. Darlene is a very important part of the Hammond, IN community. We care for her and her family deeply. My thoughts and prayers are with the entire Flores family during this most difficult time. I am so sorry for your loss. May God give all of you the strength to deal with this loss and remember that your memories will be with you forever. Amen! My condolences to all the Edwards family especially my good friend Michael. Thoughts and prayers sent your way during the hard time in your life. I'm always here for you mike and any other family member that needs a friend. Heart broken to see him go but know he with God. So Sorry for your Loss! Thoughts and Prayers will be with you thru this difficult time of grieving.